(KZN.RU, February 11, Ksenia Shvetsova). The exceeding of the epidemiological threshold for influenza and ARVI cases remains in Kazan. In the capital of Tatarstan, 118 cases of the influenza were detected, of which 89 were with children. 14 grades in 5 schools of the city are closed for quarantine, Ilnur Khalfiev, the head of the Health Department of the Ministry of Health of the RT, said this today at the Business Monday. He urged citizens to observe preventive measures and avoid visiting crowded places. The exceeding the weekly epidemiological threshold for the incidence of influenza and acute respiratory viral infections in the current season began in the fourth week of 2019. The epidemiological threshold was increased by 12.4% due to an increase in the incidence among the adult population. In the fifth week, the epidemiological threshold was already exceeded by 17.8%, also due to the adult population. Laboratory-confirmed cases of influenza were first registered in the second week of this year, noted I. Khalfiev. He added that the most effective means of infection is vaccination. About 600 thousand residents of the city, including 189 thousand children, were covered by vaccination to prevent the incidence of influenza and ARVI. To date, there are no vaccinated people with influenza, said I. Khalfiev. “All patients should get treatment. You should not play heroes and go to work or school, infecting your colleagues. We are all humans, we can get ill. 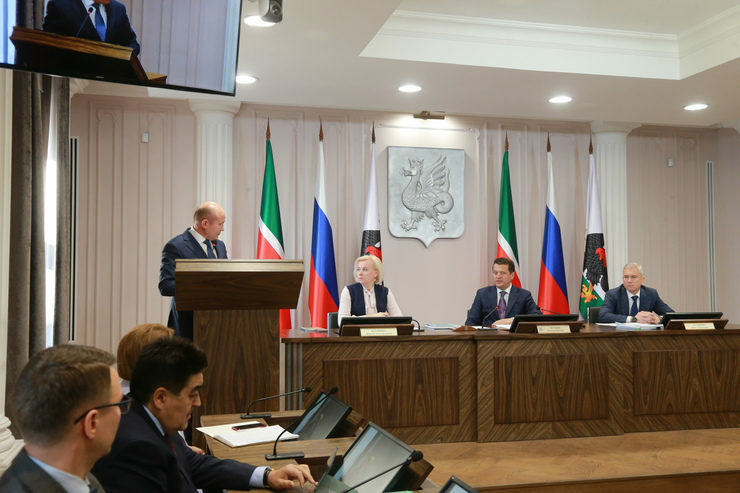 But timely prevention in this matter is very important, the methods are known”, said Ilsur Metshin, the Mayor of Kazan. The clinical signs of influenza include fever, dry cough, headaches, and muscle pain. “The most frequent complication that we see today in patients is pneumonia, severe bronchitis, and tracheitis. From the very beginning of the disease, it is necessary to stay at home, call a doctor, not try self-medication”, said the speaker. He added that patients with the flu should be isolated from other family members, the room in with the patient should air as often as possible. The virus is transmitted by airborne droplets when coughing, sneezing, and talking or by household means: the infection can be on the hands or household items. As a preventive measure, citizens are asked not to forget about wearing masks, personal hygiene, thorough washing of hands and nose. It is important to restrict visits to places of a mass gathering of people in the period of increasing incidence, especially with children. In order to increase the body's resistance to infection, experts recommend healthy citizens to use vitamins and of traditional medicine means such as onions, garlic, and others.